Babesiosis is a malaria-like parasitic disease caused by infection with Babesia, a genus of Apicomplexa. Human babesiosis is an uncommon but emerging disease in the Northeastern and Midwestern United States and parts of Europe, and sporadic throughout the rest of the world. It occurs in warm weather. Ticks transmit the human strain of babesiosis, so it often presents with other tick-borne illnesses such as Lyme disease. After trypanosomes, Babesia is thought to be the second-most common blood parasite of mammals, and they can have a major impact on health of domestic animals in areas without severe winters. In cattle, a major host, the disease is known as Texas cattle fever, redwater, or piroplasmosis. Half of all children and a quarter of previously healthy adults are asymptomatic with Babesia infection. For those who develop symptoms, they are similar to malaria, because both cause fever and hemolytic anemia. People with symptoms usually become ill 1 to 4 weeks after the bite, or 1 to 9 weeks after transfusion of contaminated blood products. A person infected with babesiosis gradually develops malaise and fatigue, followed by a fever. Hemolytic anemia, in which red blood cells are destroyed and removed from the blood, also develops. Chills, sweats, and thrombocytopenia are also common symptoms. In more severe cases, symptoms similar to malaria occur, with fevers up to 40.5°C (105°F), shaking chills, and severe anemia (hemolytic anemia). Organ failure may follow, including adult respiratory distress syndrome. Severe cases occur mostly in people who have had a splenectomy. Severe cases are also more likely to occur in the very young, very old, and persons with immunodeficiency, such as HIV/AIDS patients. A reported increase in human babesiosis diagnoses in the 2000s is thought to be caused by more widespread testing and higher numbers of people with immunodeficiencies coming in contact with ticks, the disease vector. Little is known about the occurrence of Babesia species in malaria-endemic areas, where Babesia can easily be misdiagnosed as Plasmodium. Human patients with repeat babesiosis infection may exhibit premunity. 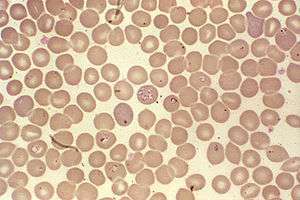 Babesia parasites reproduce in red blood cells, where they can be seen as cross-shaped inclusions (four merozoites asexually budding, but attached together forming a structure looking like a "Maltese cross") and cause hemolytic anemia, quite similar to malaria. Unlike the Plasmodium parasites that cause malaria, Babesia species lack an exoerythrocytic phase, so the liver is usually not affected. In nonhuman animals, Babesia canis rossi, Babesia bigemina, and Babesia bovis cause particularly severe forms of the disease, including a severe haemolytic anaemia, with positive erythrocyte-in-saline-agglutination test indicating an immune-mediated component to the haemolysis. Common sequelae include haemoglobinuria "red-water", disseminated intravascular coagulation, and "cerebral babesiosis" caused by sludging of erythrocytes in cerebral capillaries. In bovine species, the organism causes hemolytic anemia, so an infected animal shows pale mucous membranes initially. As the levels of bilirubin (a byproduct of red blood cell lysis) continue to increase, the visible mucous membranes become yellow in color (icterus) due to the failure of the liver to metabolize the excess bilirubin. Hemoglobinuria is seen due to excretion of red-blood-cell lysis byproducts via the kidneys. Fever of 40.5°C (105°F) develops due to release of inflammatory byproducts. Only specialized laboratories can adequately diagnose Babesia infection in humans, so Babesia infections are considered highly under-reported. It develops in patients who live in or travel to an endemic area or receive a contaminated blood transfusion within the preceding 9 weeks, so this aspect of the medical history is vital. Babesiosis may be suspected when a person with such an exposure history develops persistent fevers and hemolytic anemia. The definitive diagnostic test is the identification of parasites on a Giemsa-stained thin-film blood smear. So-called "Maltese cross formations" on the blood film are essentially diagnostic of babesiosis, since they are not seen in malaria, the primary differential diagnosis. Careful examination of multiple smears may be necessary, since Babesia may infect less than 1% of circulating red blood cells, thus be easily overlooked. Serologic testing for antibodies against Babesia (both IgG and IgM) can detect low-level infection in cases with a high clinical suspicion, but negative blood film examinations. Serology is also useful for differentiating babesiosis from malaria in cases where people are at risk for both infections. Since detectable antibody responses require about a week after infection to develop, serologic testing may be falsely negative early in the disease course. A polymerase chain reaction (PCR) test has been developed for the detection of Babesia from the peripheral blood. PCR may be at least as sensitive and specific as blood-film examination in diagnosing babesiosis, though it is also significantly more expensive. Most often, PCR testing is used in conjunction with blood film examination and possibly serologic testing. Other laboratory findings include decreased numbers of red blood cells and platelets on complete blood count. In animals, babesiosis is suspected by observation of clinical signs (hemoglobinuria and anemia) in animals in endemic areas. Diagnosis is confirmed by observation of merozoites on thin film blood smear examined at maximum magnification under oil using Romonovski stains (methylene blue and eosin). This is a routine part of the veterinary examination of dogs and ruminants in regions where babesiosis is endemic. Babesia canis and B. bigemina are "large Babesia species" that form paired merozoites in the erythrocytes, commonly described as resembling "two pears hanging together", rather than the "Maltese cross" of the "small Babesia species". Their merozoites are around twice the size of small ones. Cerebral babesiosis is suspected in vivo when neurological signs (often severe) are seen in cattle that are positive for B. bovis on blood smear, but this has yet to be proven scientifically. Outspoken red discoloration of the grey matter post mortem further strengthens suspicion of cerebral babesiosis. Diagnosis is confirmed post mortem by observation of Babesia-infected erythrocytes sludged in the cerebral cortical capillaries in a brain smear. Treatment of asymptomatic carriers should be considered if parasites are still detected after 3 months. In mild-to-moderate babesiosis, the treatment of choice is a combination of atovaquone and azithromycin. This regimen is preferred to clindamycin and quinine because side effects are fewer. The standard course is 7 to 10 days, but this is extended to at least 6 weeks in people with relapsing disease. Even mild cases are recommended to be treated to decrease the chance of inadvertently transmitting the infection by donating blood. In life-threatening cases, exchange transfusion is performed. In this procedure, the infected red blood cells are removed and replaced with uninfected ones. Imizol is a drug used for treatment of babesiosis in dogs. Extracts of the poisonous, bulbous plant Boophone disticha are used in the folk medicine of South Africa to treat equine babesiosis. B. disticha is a member of the daffodil family Amaryllidaceae and has also been used in preparations employed as arrow poisons, hallucinogens, and in embalming. The plant is rich in alkaloids, some of which display an action similar to that of scopolamine. Babesiosis is a vector-borne illness usually transmitted by Ixodes scapularis ticks. B. microti uses the same tick vector as Lyme disease and ehrlichiosis, and may occur in conjunction with these other diseases. The organism can also be transmitted by blood transfusion. Ticks of domestic animals, especially Rhipicephalus (Boophilus) microplus and R. (B.) decoloratus transmit several species of Babesia to livestock, causing considerable economic losses to farmers in tropical and subtropical regions. In the United States, the majority of babesiosis cases are caused by B. microti, and occur in the Northeast and northern Midwest from May through October. Areas with especially high rates include eastern Long Island, Fire Island, Nantucket Island, and Martha's Vineyard. In Europe, B. divergens is the primary cause of infectious babesiosis and is transmitted by I. ricinus. Babesiosis has emerged in Lower Hudson Valley, New York, since 2001. In Australia, babesiosis of types B. duncani and B. microti has recently been found in symptomatic patients along the eastern coastline of the continent. A similar disease in cattle, commonly known as tick fever, is spread by Babesia bovis and B. bigemina in the introduced cattle tick Rhipicephalus microplus. This disease is found in eastern and northern Australia. A table of isolated cases of babesiosis, which may be underestimated given how widely distributed the tick vectors are in temperate latitudes. Africa (Egypt, Mozambique, South Africa) Uncharacterized spp. South America (Brazil, Colombia) Uncharacterized spp. The disease is named for the genus of the causative organism, which was named after the Romanian bacteriologist Victor Babeş. In 1888, Victor Babeş identified the microorganisms in red blood cells as the cause of febrile hemoglobinuria in cattle. In 1893, Theobald Smith and Frederick Kilborne discovered that a tick was the vector for transmission in Texas cattle. The agent was B. bigemina. This was the first demonstration that an arthropod could act as a disease vector to transmit an infectious agent to a vertebrate host. In 1957, the first human case was documented in a splenectomized Croatian herdsman. The agent was B. divergens. In 1969, the first case was reported in an immunocompetent individual on Nantucket Island. The agent was B. microti, and the vector was the tick I. scapularis.Equine babesiosis is also known as piroplasmosis (from the Latin piro, meaning pear + Greek plasma, a thing formed). Veterinary treatment of babesiosis does not normally use antibiotics. In nonhuman animals, diminazen (Berenil), imidocarb, or trypan blue would be the drugs of choice for treatment of B. canis rossi (dogs in Africa), B. bovis, and B. bigemina (cattle in Southern Africa). In acute cases in cattle, blood transfusion may be carried out. A vaccine is effective against B. canis canis (dogs in the Mediterranean region), but is ineffective against B. c. rossi. B. imitans causes a mild form of the disease that frequently resolves without treatment (dogs in Southeast Asia). ↑ Berger, Stephen A.; Marr, John S. (2006). 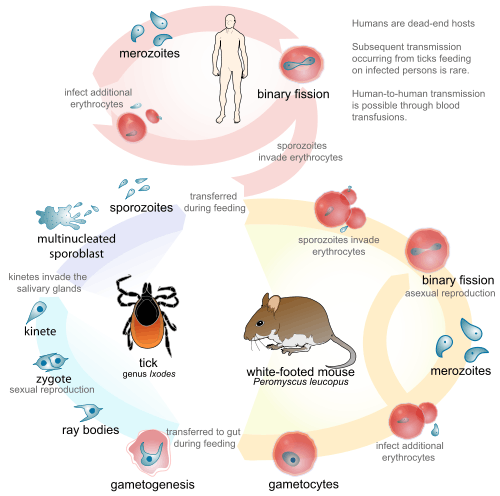 Human Parasitic Diseases Sourcebook. Jones & Bartlett Learning. ISBN 978-0-7637-2962-2. ↑ Prevention, CDC - Centers for Disease Control and. "CDC - Babesiosis". www.cdc.gov. Retrieved 2015-10-25. 1 2 3 4 5 6 7 8 9 Vannier, Edouard; Krause, Peter J. (21 June 2012). "Human Babesiosis". New England Journal of Medicine. 366 (25): 2397–2407. doi:10.1056/NEJMra1202018. PMID 22716978. 1 2 3 Hunfeld KP, Hildebrandt A, Gray JS (2008). "Babesiosis: Recent insights into an ancient disease". Int J Parasitol. 38 (11): 1219–37. doi:10.1016/j.ijpara.2008.03.001. PMID 18440005. ↑ Wormser GP, et al. (2015). "Neutropenia in congenital and adult babesiosis". Am J Clin Pathol. 144 (1): 94–96. ↑ Shaw, Susan E.; Day, Michael J. (11 April 2005). Arthropod-borne Infectious Diseases of the Dog and Cat. Manson Publishing. p. 71. ISBN 978-1-84076-578-6. 1 2 Noskoviak K, Broome E (2008). "Images in clinical medicine. Babesiosis". N Engl J Med. 358 (17): e19. doi:10.1056/NEJMicm070903. PMID 18434647. 1 2 3 Wormser GP, Dattwyler RJ, Shapiro ED, et al. (November 2006). "The clinical assessment, treatment, and prevention of Lyme disease, human granulocytic anaplasmosis, and babesiosis: clinical practice guidelines by the Infectious Diseases Society of America". Clin. Infect. Dis. 43 (9): 1089–134. doi:10.1086/508667. PMID 17029130. ↑ Krause PJ (2003). "Babesiosis diagnosis and treatment". Vector Borne Zoonotic Dis. 3 (1): 45–51. doi:10.1089/153036603765627451. PMID 12804380. ↑ Krause PJ, Telford SR, Ryan R, et al. (April 1994). "Diagnosis of babesiosis: evaluation of a serologic test for the detection of Babesia microti antibody". J. Infect. Dis. 169 (4): 923–6. doi:10.1093/infdis/169.4.923. PMID 8133112. ↑ Persing DH, Mathiesen D, Marshall WF, et al. (August 1992). "Detection of Babesia microti by polymerase chain reaction". J. Clin. Microbiol. 30 (8): 2097–103. PMC 265450 . PMID 1500517. ↑ Krause PJ, Telford S, Spielman A, et al. (November 1996). "Comparison of PCR with blood smear and inoculation of small animals for diagnosis of Babesia microti parasitemia" (PDF). J. Clin. Microbiol. 34 (11): 2791–4. PMC 229405 . PMID 8897184. ↑ Vannier, Edouard; Krause, Peter J. (21 June 2012). "Human Babesiosis". New England Journal of Medicine. 366 (25): 2397–2407. doi:10.1056/NEJMra1202018. PMID 22716978. ↑ Tanyel, Esra; Guler, Nil; Hokelek, Murat; Ulger, Fatma; Sunbul, Mustafa (2015). "A case of severe babesiosis treated successfully with exchange transfusion". Int J Infect Dis. 38: 83–5. doi:10.1016/j.ijid.2015.07.019. PMID 26232090. ↑ "Imizol | Overview". Merck Animal Health. Retrieved 15 August 2015. ↑ James A. Duke. disticha ""Boophone disticha"(Liliaceae)" Check |url= value (help). Dr. Duke's Phytochemical and Ethnobotanical Databases. Retrieved November 10, 2011. ↑ Herwaldt BL, Linden JV, Bosserman E, Young C, Olkowska D, Wilson M (2011). "Transfusion-associated babesiosis in the United States: a description of cases". Ann Intern Med. 155 (8): 509–19. doi:10.1059/0003-4819-155-8-201110180-00362 (inactive 2016-08-29). PMID 21893613. ↑ Leiby DA (2011). "Transfusion-associated babesiosis: shouldn't we be ticked off?". Ann Intern Med. 155 (8): 556–7. doi:10.1059/0003-4819-155-8-201110180-00363 (inactive 2016-08-29). PMID 21893616. ↑ Giannini, A. James; Black, Henry R.; Goettsche, Roger L. (1978). Psychiatric, psychogenic, and somatopsychic disorders handbook: a laboratory and clinical guide to the medical management of emotional and intellectual pathology. Medical Examination. p. 86. ISBN 978-0-87488-596-5. ↑ Belluck, Pam (September 6, 2009). "Tick-Borne Illnesses Have Nantucket Considering Some Deer-Based Solutions". The New York Times. Retrieved September 6, 2009. ↑ Herwaldt BL, Persing DH, Précigout EA, et al. (1996). "A fatal case of babesiosis in Missouri: Identification of another piroplasm that infect humans" (PDF). Annals of Internal Medicine. 124 (7): 643–50. doi:10.1059/0003-4819-124-7-199604010-00004 (inactive 2016-08-29). PMID 8607592. ↑ Mylonakis E (May 2001). "When to suspect and how to monitor babesiosis". Am Fam Physician. 63 (10): 1969–74. PMID 11388711. ↑ "Babesiosis FAQs". Centers for Disease Control and Prevention (CDC. May 5, 2009. Retrieved September 6, 2009. ↑ Joseph JT, Roy SS, Shams N, Visintainer P, Nadelman RB, Hosur S, et al. (May 2011). "Babesiosis in Lower Hudson Valley, New York, USA" (PDF). Emerg Infect Dis. 17 (5): 843–7. doi:10.3201/eid1705.101334. PMC 3321771 . PMID 21529393. 1 2 Mayne PJ (2011). "Emerging incidence of Lyme borreliosis, babesiosis, bartonellosis, and granulocytic ehrlichiosis in Australia". Int J Gen Med. 4: 845–52. doi:10.2147/IJGM.S27336. PMC 3258014 . PMID 22267937. ↑ Queensland Government, Department of Primary Industries and Fisheries. "Tick fever (bovine babesiosis)". Archived from the original on 5 April 2011. Retrieved 21 February 2012. ↑ Kim JY, Cho SH, Joo HN, et al. (June 2007). "First case of human babesiosis in Korea: detection and characterization of a novel type of Babesia sp. (KO1) similar to ovine babesia" (PDF). J. Clin. Microbiol. 45 (6): 2084–7. doi:10.1128/JCM.01334-06. PMC 1933034 . PMID 17392446. ↑ "babesia" at Merriam-Webster online. ↑ Victor Babeş at Who Named It? ↑ "Definition of Piroplasma". lexic.us. Retrieved November 9, 2011. Center for Global Health. "Babesiosis". Parasites and Health, DPDx — Laboratory Identification of Parasites of Public Health Concern. Centers for Disease Control & Prevention. — Public domain source from which the first version of this article was derived. Homer MJ, Aguilar-Delfin I, Telford SR, Krause PJ, Persing DH (July 2000). "Babesiosis". Clin. Microbiol. Rev. 13 (3): 451–69. doi:10.1128/CMR.13.3.451-469.2000. PMC 88943 . PMID 10885987.